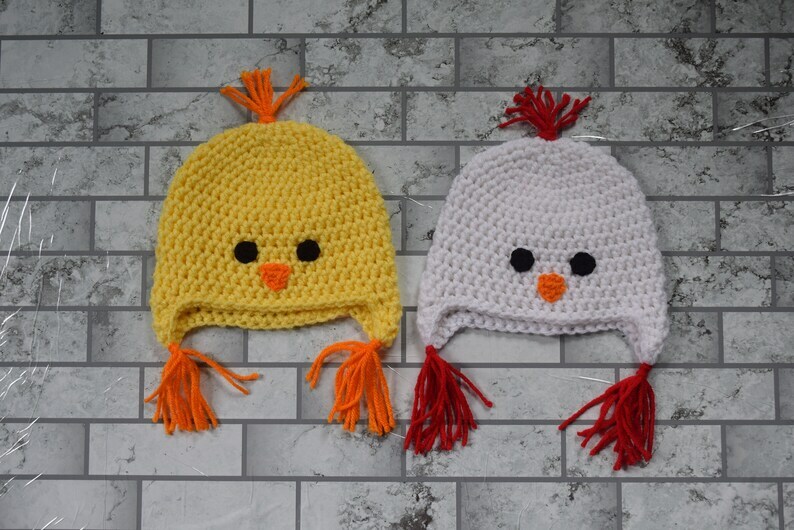 These Chicken and Rooster hats are adorable. They would make great photo prop, Halloween costume, or even a great hat for Easter. They come in all sizes so pick one up for every member of your family. The Chicken Hat is yellow with orange accents and the Rooster Hat is white with red accents. ** IMPORTANT ** – Measure your child's head to ensure that the hat will fit. If the size hat you are ordering based on circumference doesn’t match your child’s age, please let me know in the notes section at checkout. That way I can make the circumference of the hat the needed size but adjust the height of the hat to better fit their age. The hats do stretch to an additional 1” to 1 ½” larger than the circumference size to allow for growth. For hygienic reasons these hats can not be returned if worn. Made lovingly in a smoke-free home with Durable Acrylic Yarn. These hats are crocheted by me and are made to order so please allow up to 2 weeks for them to be made and shipped (although this is worst case scenario). Adorable and well made! Quick shipping and great costumer service!